An unprecedented two major news-making events took place at two separate amusement parks in the U.S. within minutes of each other on Friday, bringing up the inevitable media hype over ride safety. At Six Flags Over Texas and Cedar Point, two major incidents occurred that have splashed across the media. In the wake of yesterday’s tragic event and subsequent investigation at Six Flags Over Texas, Iron Rattler at Six Flags Fiesta Texas has been closed as a precautionary measure, according to a park representative. The ride features the same style of “Iron Horse” track as the Texas Giant and same train manufacturer, Gerstlauer of Germany. Our thoughts and prayers go out to everyone involved in today’s tragic events. When reporting news, there’s always the possibility of reporting inaccurate information. When the story is breaking, that risk is even bigger. These stories are no different. Here’s the problem – the Texas Giant doesn’t use “clicking” restraints. 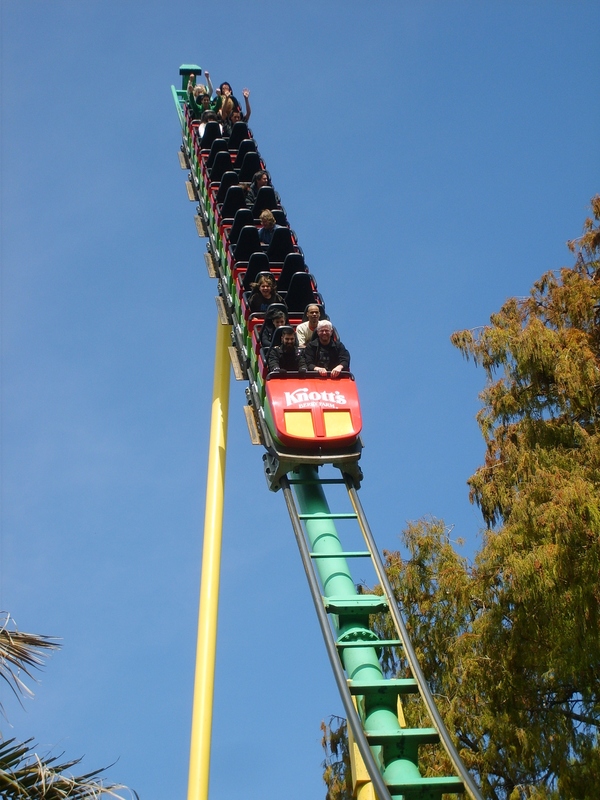 In fact, according to Gerstlauer, the manufacturer of the trains for the Texas Giant, “The cars feature four self-restraining seats with T-shaped lapbars.” It continues, “The use of redundant hydraulic cylinders ensures that each lap bar can be infinitely adjusted and offers maximum security.” in other words, these restraints come down in silence. As I was just out at Six Flags Over Texas about five weeks ago, I can attest to this fact. The Texas Giant also features an electronic indicator light on each train, (one for each restraint) which alerts operators if a restraint is too high for safety. The light turns from red to green. It should not be lost on anyone, but you should know – your odds are far greater of being injured DRIVING to your local amusement park then they are INSIDE your local amusement park. In addition, if you do not feel confident in a ride – you always, ALWAYS have the choice of simply asking to be let out.